I think you'll find the Republican increased and the Dem waned at around the same time in PA and WI. Just in the other seats the Republican is flawed enough that the race went from lean Dem to lean GOP. 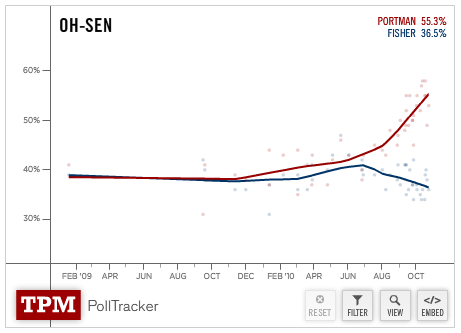 In OH it went from tossup to likely GOP. Or we can all start believing that foreign money bought this election, if we want to hate on democracy. I've looked at a couple other states, and no place has effects over that time frame quite this drastic. August is generally a bad month for Democrats, but the time period from then to the present usually doesn't involve the Republican adding 15 points to his lead. There may not be a state with a wider and more bitter gulf between the Democratic Party establishment and the progressive base than Ohio. Fisher is a boring and ineffectual campaigner with a long track record of failure. The Ohio Democratic Party brutally strongarmed his primary victory over a much better candidate, thereby permanently alienating many progressives. 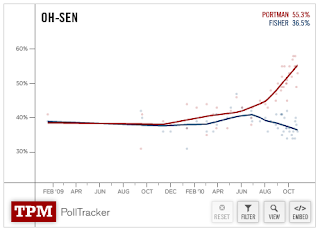 So there is a huge enthusiasm gap in this race -- which, by the way, there is not in the other statewide races.